This is one of the beers of the future. Ferran Adria, the creator of El Bulli, designed this beer to pair with food in the same way that red wine does. Estrella Damn, the main brewery in Barcelona, was commisioned to make the beer. Inedit in spanish means "Never been done before" and this is true of this beer. Estrella Inedit is a unique blend of lager and wheat beers, and this makes it incredibly drinkable. I have had many many of these before and it is truly spectacular, this however will be the first time I have reviewed it properly. The beer utilises all of the usual beer ingredients but also coriander and orange peel in it's brewing. Anway let's do this! The beer pours really well, the colour is a hazy straw with a good sized creamy looking head. This head has excellent retention and laces the glass brilliantly! The head appears to thin out a little of the course of the beer, however it's very hard to fault, possibly because of it's wheat beer origins; have you ever seen a Hoegaarden head fall over... There appears to be heaps of carbonation and this I believe helps with the head retention. Great looking beer! 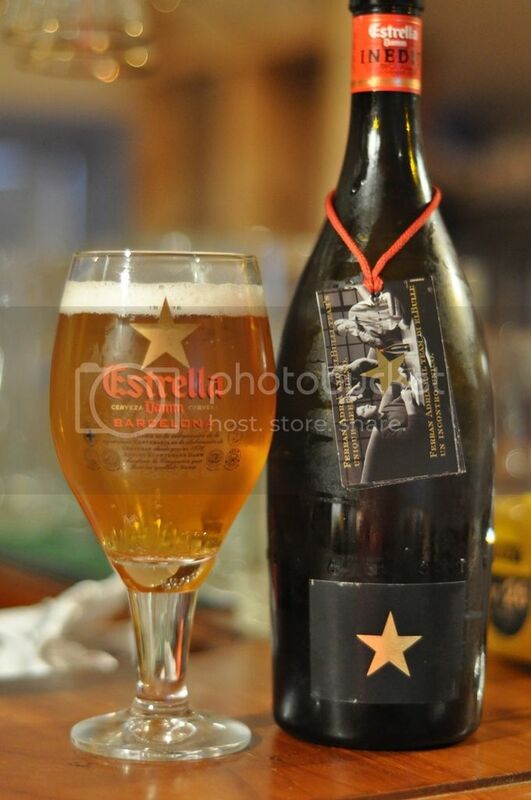 Estrella Inedit is quite soft on the nose, there are lots of soft malts coupled with a strange pilsner like sweetness. As strange as that sounds I am trying to describe the pilsner taste before the hops kick in.. The orange peel is actually quite notable, as is a strange peppery aroma which is quite intense. The hops are not particularly prominent, but they are of a herbal variety which I assume will compliment the corriander later on. It's a very pleasant overall feel! So at this point I will point out that this is not a session beer, have it with food or it really doesn't taste that good! But, as was it's intention, the beer compliments food brilliantly. The beer is very fruity, with strong hints of the pepper the nose promised. The hops are not as strong as they could be but still do enough to balance this beer beautifully. Basically this beer tastes like a more refined Hoegaarden, with added spicyness and complexity; simply a must try for all! I don't think there is a beer that goes better with food anywhere in the world! Brilliant, brilliant beer! This beer should be in every single restaurant that serves beer! Quite seriously this beer costs $9 for a bottle as big as a wine bottle, if you couple this with your average stubbie selling for $8 at each restaurant, they could easily sell this fantastic looking bottle for $20 making a profit over 200%. This is one of the best quality/price beers available in Australia, whatever you do go out and get this beer and have it with dinner. You will not regret it, I guarantee it!